Place the potatoes in a 4 to 6-quart slow cooker and top with the pork. Stir the gravy, thyme, red pepper and peas in a medium bowl. Pour the gravy mixture over the pork and potatoes. Cover and cook on LOW for 7 to 8 hours or until the pork is fork-tender. Time-Saving: Or the recipe may be cooked on HIGH for 4 to 5 hours. 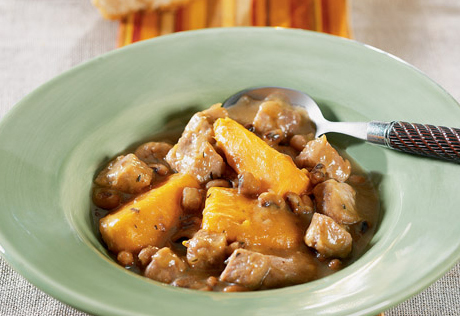 This is recipe is a good base or stew starter. I’m from the Deep South, and we don’t just cook where I’m from we COOK, so the current recipe was pretty bland to me. Thats why I added a few more ingredients. I couldn’t find Campbell’s Chicken Gravy, so I used Campbell’s Cream of Chicken instead, and mixed it with a pack of dry chicken gravy. I added about a cup of frozen diced onions/peppers, a half teaspoon of cardamom, half teaspoon of turmeric, half teaspoon of garlic, half teaspoon of oregano, half teaspoon of onion powder, one teaspoon of black pepper, 2 teaspoons of cilantro, about a tablespoon of sugar, one chicken bouillon, and one can of whole tomatoes. It tasted pretty good with those ingredients but I still needed an acid to balance it, so I added juice from half a lime! I served it with grilled cheese (American cheese), and it was soooooooo gooooood!! !